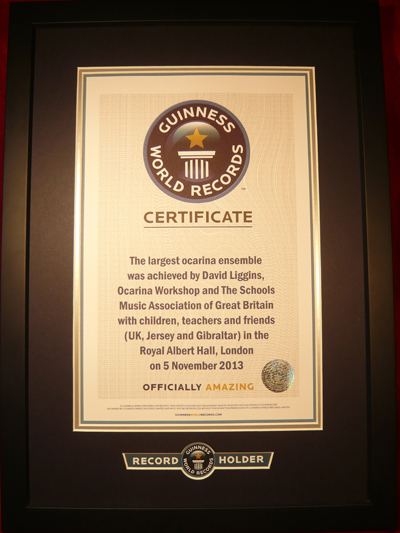 Last night a new Guinness World Records™ Largest Ocarina Ensemble record was created by school children from all over the UK, Jersey and Gibraltar. 1,300 T-shirted children with yellow ocarinas around their necks rehearsed all afternoon. And in the evening, during a wonderfully musical Barnardo’s Supporters Concert, they helped ocarina expert David Liggins to rehearse the whole audience, ready to play the performance piece. The previous record of 831 ocarina players was smashed by 3,081 children and adults, with their World Premiere Performance of Douglas Coombes “Ode to a Joyful New Star” accompanied by the Royal Albert Hall Grand Organ. More than 130 observers checked that every single person played for the whole seven minutes, and two expert witnesses, Angela Ruggles and Adrian Mezzetti, assessed the musicality and proficiency of the whole performance. Meanwhile, behind the scenes, hundreds of Barnardo’s and Schools Music Association volunteers kept the show on the road with expert precision. Whilst the second half of the concert moved to its conclusion, teams of observers were collating seating grids to identify the exact number of people to be included in the record. A communal hush greeted the Guinness World Records Adjudicator, Mark McKinley, as he announced that a number of people had been excluded for giggling, taking photographs and not playing as required. The hush turned to wild jubilation at the mention of “three thousand…” – the final figure lost as children and adults leaped up and down with delight. These amazing scenes were made possible by the hosts, sponsors, volunteers, teachers and parents and by the children themselves, without whose enthusiasm and dedication the record could not have been attempted. At Ocarina Workshop, we would like to thank everyone involved in the concert to raise valuable and much-needed funds for Barnardo’s in their critical work with children. The evening also gave everyone a musical memory to treasure and launched some into a lifetime of instrumental music-making:A musical record created by children for children. As one young performer said, the evening was “unforgettable”… and another described it as “life-changing”. That sums it up completely for us all. And the audience who joined in the successful World Record Attempt.